I have learnt from my other business that relationships come first and sales follow. 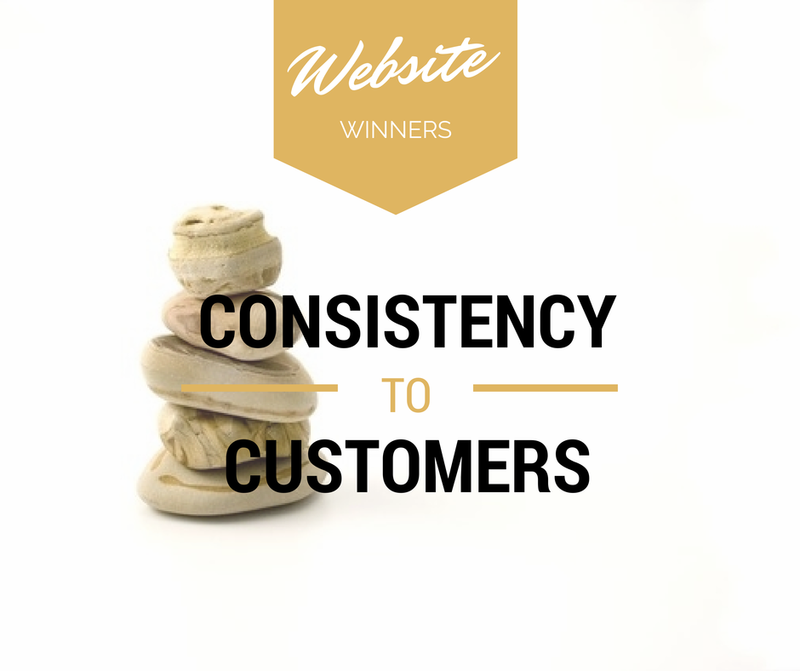 When you are developing a brand, it’s important to ensure that you remain consistent. As a business, there are a number of things you need to be consistent with: your brand, your goals, and your customer. A brand is much more than just your business name, it’s the experience that people associate with that name. It is this experience, which is the first step in building a relationship, which leads on to sales. So if your aim is to have a brand that represents quality, integrity, service, and trust; if this is the customer experience you desire, then you need to ensure you are consistent. This consistent branding will help you to be consistent with your customer (and that’s half your consistency battle won). Most sites will have the same name, contact details, and logo across the site. If you don’t, this is a quick change for you to make. Ensure that any ‘contact us’ links are headed to the same contact page or the correct email account; any differences in these can leave a customer questioning if you will be just as inconsistent in your dealings with them. Your name is a little more complex than just what appears on the homepage of your website. It extends to how you refer to your business and yourself as the owner. This is all dependent on the relationship your customer will want from you (professional, approachable, etc.) and the perception you want to build for the business (professional, approachable, etc.). You should have worked this out when finding your online voice, if not, I suggest you revise my blog posts on the topic. The reason being, and as you can see, these perceptions can and should align. If they don’t you are risking confusing your customers and missing the mark with your ideal customer. So when you are writing about the business, will you refer to it by name (full or shortened), using the term ‘we’, or in some other form? When you refer to yourself as the owner, will you use ‘I’ or your name? The decisions you make here need to be consistently applied across the site. This means within a page and between pages. Remember, people generally don’t like change – so keeping your website consistent will put them at ease. Following on from keeping your brand consistent is keeping your tense consistent (past, present, future). I have read a lot of articles and sites where the author flits between present and past tense. Again, this swapping causes confusion in the reader. I encourage you to use the present tense for your writing. I choose the present tense as it creates a more conversational tone, it’s easier to read, and easier to write. That’s not to say that you can’t write about the past, it just means you need to consider how it’s written. In these circumstances I would suggest using a more active voice; where the past, and these are mostly achievements, is written in short sentences, using your key adjectives (check out the voice blog post on this), and placing your business name before any action or achievement. If you are writing about achievements, I would also place the year of the achievement at the start of the sentence. Having the date at the start of a sentence creates a simple chronology, building a picture of achievement in your customer’s mind. People are generally time poor: make it easier for them to know you. A consistent brand makes it easier to build a relationship with your customer. It means that they know where you stand and as a consequence where they stand in relation to your business. If you consistently refer to your brand in a particular manner, it helps to place your brand in the front of their mind. If you match that brand with their experiences of the brand (consistent, reliable, quality, etc.) you will help them form an opinion around your brand. This is when you build a relationship, and you can then you can build on sales. Building your brand takes time; consistency makes brand building over time easier. It means that you don’t have to reinvent the wheel. If you find consistency difficult to maintain, then I suggest developing a style guide for your business. I have previously referred to having a style guide and I suggest printing it out for your reference. Style guides are useful when you have multiple people writing for your business, including employing a writer (including website developers). Remember, a consistent brand is the foundation of a lasting relationship with your customer. If you are finding it difficult to achieve consistency across your site, not sure where to start, or are time poor please contact us to find out how Write to Right can help. 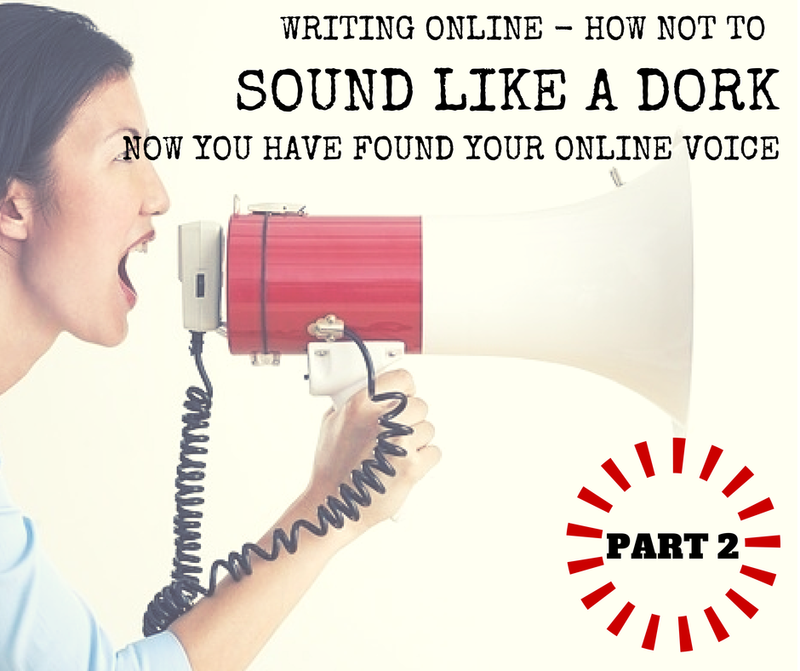 Now you know how to find your online voice, use these tips to use your online voice (and not sound like a dork). Now you know who your ideal customer is, you need to hangout where they do. You have your website, you need to make sure that you promote it at any possibility. This means sharing links, linking to it from your social media profiles, and adding it to your promotional material. If your ideal customer values quality, then make sure your website reflects this, have a look at our health checks as a way to ensure the quality of your site. Facebook, this is one of the most popular social media platforms. I have written on where businesses fail on Facebook, make sure you read these tips (or print them out). Above all, keep it positive and sociable on Facebook as people use this platform to escape from the drudgery, catch up with friends, and have fun. Twitter, this is a great place to develop your network and share information about your business. Because you need to be brief make use of a URL shortening service, some websites have their own, when linking to your site. Twitter users love to be recognised, so don’t neglect thanking and recognising follows and retweets. Pinterest is primarily used for people who love to DIY, travel, interior design, beauty, and fashion. If your business has a product that is for children, fashion conscious, DIYers, or home improvers/interior design fans I would strongly suggest getting on to Pinterest. Not only is it a great way to advertise your products, it is a great way to find content for your other social media platforms, and provides valuable backlinks to your website. Ensure your message focuses on benefits over features, your customer’s needs over your business needs, and you remember the medium. If you are using social media, be aware that although people (in general) are not as concerned with spelling and punctuation, you are still representing your brand. If your brand represents, values, and your customer values quality then make sure that your posts/tweets/pins/instagrams all reflect this. Ensure you use the adjectives that you identified earlier. This subtle reinforcement will speak to your customers who value these attributes. Remember that you need to speak to your ideal customer. You can also experiment with these words to discover which ones hone in on their inner most needs and desires. These keywords will then help you drive your business. They can then be used in other marketing materials. Be warned, your ideal customers may not all hang out in the same social media circles and what works on one platform, may not work on another. Now this by-no-means means that you should use a social media management tool and post the exact same message across all of your social media accounts. In fact, your followers can be turned off by that. Some customers will subscribe to your newsletter and follow you on Facebook, Twitter, Pinterest, Instagram, and/or Google +. If they see the same message posted across your channels they will know that you are not being authentic, interested in their needs, and they will feel that you are simply pitching to them. By now you know your ideal customer’s likes and dislikes, remember the profile, so make them feel valued and that they are the only one you are talking to. When you write a job application, most are looking for concrete examples where you achieved an outcome, not just the fact that you know what to do. Customers are no different. They want runs on the board, bang for their buck. Show them! Customers value third-party opinions. Remember the power of word of mouth. On your website, or social media platform, you can control how these are displayed. I am not saying to remove every bad review, in fact I advocate keeping them and using some strategies I have previously shared, you can actually turn the negative experience around. You may even help others to explain your processes, a situation, or a learning just by keeping all channels of communication open. Facebook reviews – If you set your page to local or small business and include a physical address (don’t worry it doesn’t have to be exact), then you will get the review stars popping up on your page. Be warned, if someone accidentally gives you one star it can’t be undone and will effect your rating. You can ask customers to leave review posts on your page. These used to be able to be highlighted on your page. They now appear in the left hand margin of your page. You can reorganise this left margin so they appear higher up. You can also hide general chit-chat posts, so they don’t interrupt the reviews. Website reviews – There are many plug-ins you can add to your page. I have one on one of my WordPress sites which I populate with feedback customers have sent through. I have seen others where it is populated by the customer. Alternatively, you can set up an email form where customers can send feedback through to you. Other pages will have a page of testimonials (like I have here). These testimonials can stand alone as their own page, but they are also a handy way to add credibility to a related blog post or marketing material (including a blog post). For me, the key to all of this is working with integrity. People value honesty and integrity. We make mistakes, own them, own up to them, fix them, learn from them, and move on. This is why I believe it’s important to keep negative feedback in the public domain. Handled with tact and integrity they can prove as valuable as a positive testimonial. In the first instance, be true to yourself. Most businesses, especially ones that come from a place of internal passion, are extensions of the owner. If you are not speaking honestly, and from the heart, you are less likely to do so with conviction, less likely to convince and convert, and when it comes to meeting the client, you are likely to be tripped up. Be true to your customer. Now this isn’t just about owning where things haven’t gone as planned. It means being true to your ideal customer. You need to honour their needs, and place these at the core of your business. Print off your ideal customer description, find photos of them, make a vision board of them; all of these ideas will keep them centred in your work space and will remind you when you work. Truth is easier to remember. Integrity will take you far. Now you know how to find your online voice, allow me to help you reach your ideal customer. By using the process in this series of blog posts, I was able to focus my business and move it from page 16 in a Google search to page one. If your ambition is to have your business appear on page one of Google, then contact Write to Right about a website health check. This check will get your website in to shape and my hints will improve its ranking. Read more about the website health checks or if you are ready to be on page one now, contact Write to Right now. Ever wondered how to write about yourself online without sounding like a “complete dork” or a “know-it-all”? Finding that happy medium to sell yourself positively online can be difficult. The following steps will give you and therefore your business a strong, client-focused and cohesive online presence. Does your business have a mission statement? Do you know why you are spending your time in business? Why– Why do customers use your business? What is the benefit to them? Do you have a vision statement? Do you know where you want your business to be in one year, three years, or five years? Measurable– If it can’t be measured, then how can you look back and see if you have achieved it? It also means that it’s likely to be a motherhood statement and you are less likely to hold yourself to account. Achievable– The goal has to be appropriate and able to be attained in the given timeframe. Reportable– You have to make yourself accountable for the goal and the only way to do that is to make it reportable. That could be in your end of year financial report, quarterly reports, cash flow reports, stakeholder reports, or reportable to a mentor/friend. Time-sensitive– The goal has to have a deadline. Don’t make it a moveable goal or you are less likely to set tasks to achieve the goal. Evaluated– Is it reasonable, achievable, and how does it compare to others in your industry? Reviewed– How often will it be reviewed so you know that you are on track? I like the added aspects of evaluation and review. These not only speak to the quality assurer in me, they are best practice in project management. I use many aspects of project management in my own business, especially review. Many businesses underestimate the value of reviewing, especially when things don’t turn out as anticipated. I think I will write more on this in the future as I can see a whole blog post on this topic. Marketing experts have a number of ways to determine your ideal client. I use scripts to determine my ideal client. When you script your ideal client you write a little story about who they are. It’s like writing an online dating profile for your soul mate. Demographics– What is their age (or age range), gender, family status, and employment status. This is all about who they are. Preferences- What are their values, likes, and dislikes? Do they differ between the ones they hold personally, for their family, or for their business? Daily activities– How do they spend their day? Do they work 9-5 in an office? Do they work part-time? Do they work in an office or from home? Are they running around after the kids? Are they single living a laissez-faire lifestyle? Are they retirees? Do they play sports? Write about how they fill their day/weekend. Write up this narrative, and don’t worry you can have more than one (though it’s easiest to pitch to one client) and it can change over time. Just make sure you keep this person firmly in your sights. Where do your mission and visions cross? Are there any common words or themes? Where does you ideal customer meet with your mission? With your vision? List the adjectives, or find relevant adjectives, to describe these intersections. These are the words you use to drive your interactions. There’s a word of warning, they must be for your client. If you start writing about the business it becomes about you. You don’t need to sell to, or convince, you. Unless your ideal client is a competitor, don’t write about your industry either. Your customer doesn’t want to know why your industry does xyz, they have a need and want you to meet it. It’s why they are at your website/Facebook/Google+ (or other platform, more on this soon). I would suggest that if your business has more than one person writing for it that you establish a style guide. While I use the Commonwealth Style Manual for proofreading, I also worked with a departmental style guide. This certainly helped when writing for different media and clients. There were guides for press releases, ministerials, client letters, and an overarching guide. Unless you are a business with a few hundred staff who communicate across many media and stakeholders, you are unlikely to need this many guides. However, a document that outlines your mission, vision, ideal client, benefits, key adjectives, and preferred tone is a great start. From here it can evolve to including which messages are distributed over particular media. You can even detail how minutes will be taken and distributed. Find out how to use these skills online. Learn how to customise your content for different social media platforms. Find out how to ensure your brand’s profile. Hear how to instil a piece of yourself into the business and online. Make sure you Follow this blog by signing up for email updates. Smart business owners know that the best place to sell, outside of their bricks and mortar, is online. Some have tried Facebook, but with declining reach, the smartest ones are moving to web sales. Sadly, it’s no ‘Field of Dreams’; if you build it, there’s no guarantee that they will come. Sound familiar? Struggling to get customers to your site? Google is the most used search engine. Like Facebook, Google has its own methods for working out the ranking for pages in a search result. I don’t know of many small businesses that would pay for Google rankings, and to be honest if you pay, your result is only as good as the amount you or your competitor pays (the more the better). Focusing on the following hints will boost you through Google. How do I know? I did it. I moved my website from page 16 at launch to the first listing on page 2. I also have related content listed on page 1, this links to my website. So I am on page 1 and 2 of Google Search. Follow these steps to get there too. Key words are that: key. If you do not use the words in your website that your customers use in their searches then you are starting behind the eight ball. There are a number of ways to find out what these words are: trial and error, ask your customers, put yourself in your customer’s shoes, Google Analytics, or paying SEO experts. But be warned, don’t make your website a gobbledegook mess of keywords. Google has its ways of weeding out nonsensical pages. This is where SEO experts and copywriters can fail. These businesses don’t understand the intricate details of your business, quite like you. You know the benefits for your customers, you know how they use your goods or services. You know what makes your business unique. Don’t think spelling on your website is important, think again. 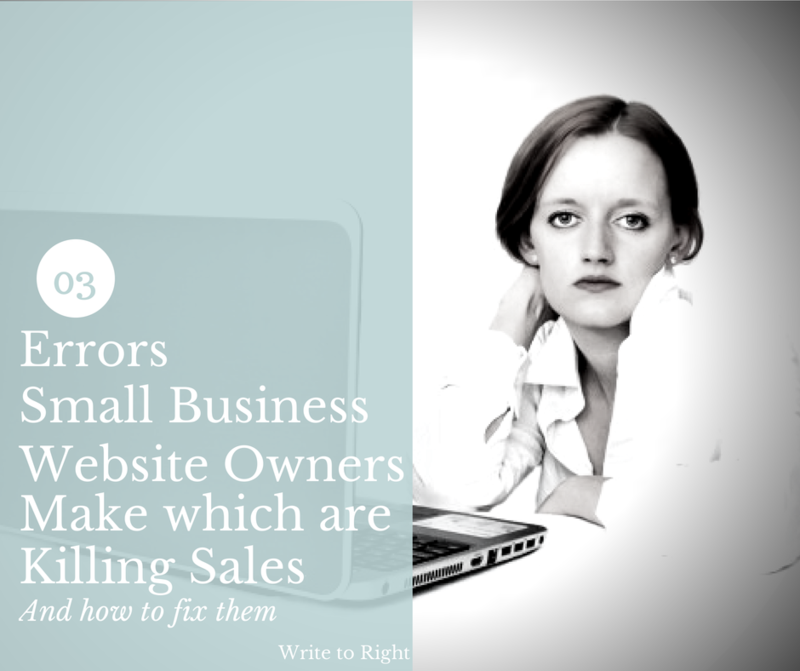 Research shows that 59% of customers will not buy from a website with spelling errors. That’s a lot of lost revenue. Why? Quality. Customers believe that if you don’t value the basic skill of spelling, then you are less likely to value them or quality service. But what does this have to do with Google? Have you ever misspelt something in a Google search? It autocorrects. I’m sorry to say Google will not autocorrect your website. If you type words incorrectly in your website, then that is how they will be indexed by Google and how people will have to type them in a search. Small problem, Google autocorrects searches. See the problem? Remember how I said I was on page 2 AND page 1, well my page 1 results are my social media pages (Google + and Facebook). I know many businesses start on Facebook and with the declining reach they develop a website, you might be one of them. Don’t get caught up trying to fill Facebook or G+ (or any other platform) with new content, link to your website. Links on Facebook are not just a simple way to populate posts, they are actually a highly respected (and ranked) post type for the platform. Using links to your site drives traffic to where the sales take place. (You can also set up a tab to import your shop into Facebook, more on that another post) Google likes inbound links (coming in to your site) as they are third party endorsements. Link within your site. Linking within your site allows for cross promotion and cross or upselling. Internal links also work as when Google searches your page the internal links direct it through your site. The more pages Google sees, the more pages it knows of to put in its search results, the more often you are seen in Google. Like to know more? Not sure you could do this all yourself? Don’t have enough time to go through it all yourself? Based on my experience managing websites and proofreading and copy editing for the federal government I am offering my skills to businesses to improve their website results. Having your website appear higher in Google search results will mean more customers to your site (most people will stop searching at page 3 of Google). Write to Right offer two levels of health checks. The first is for larger sites or those businesses after a more comprehensive service; the second is for smaller sites or those looking to brush up their essential pages. To book you website health check, contact us. What do others say about the Website Health Check? This health check is for businesses looking to grab those 59% of customers who are put off by errors on their website. It’s for businesses that rely on their website to sell their products and services 24/7. It’s a check for businesses that pride themselves on their excellence and attention to detail. • Free email follow-up one month after the report is delivered. This premium service is offered to you for the introductory price of $185. It is a small price to pay when it has the potential to turn up to 59% of your web traffic into paying clients. Book your comprehensive website health check by contacting us. This health check is for those smaller sites with fewer non-product pages. It is perfect for those businesses just starting out but still pride themselves on how their business is presented to the public. • Include an Excel spreadsheet report for you, or your developer, to keep for implementation. This essentials health check is a wise investment at $95 and a fantastic way to ensure you are starting out on the right foot. Is your site larger than average or do you want more? If your site has more than ten non-product pages, or you would like to include your product pages, we can perform a more comprehensive check for $80/hr and includes all of the elements in the comprehensive website health check. Write to Right is able to offer proofreading & copy editing for all other documents, please contact us for our full list of fees. To book your website in for a health check contact us. Anyone else seen this on their Facebook Insights? I hope they increase and/or discover the posts since June 30 are also affected. 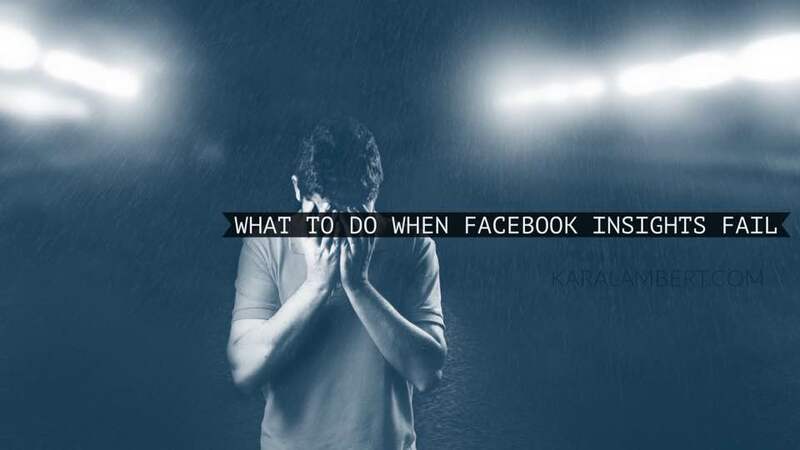 What are the implications of the #facebookfail? Decreased reach means that fewer customers see your business in their Newsfeed. But don’t panic just yet. Your reach only affects your page for two weeks after the post is made. If you don’t know what your fans like, then look through your posts and see where you have great engagement. Now plan, plan, plan. Keep an eye on the Write to Right Facebook page for updates on the Facebook fix, but in the meantime draft some posts, build some collages, and take some new photos. Keep it in line with your business’ online image/tone. Comment below and let us know your favourite Facebook hints and how you fare the insights bungle.